Mango cake and chocolate brownies might seem a world away from politics and rising levels of anti-Muslim feeling. But Great British Bake Off contestant Ali Imdad is on a mission to counter negative stereotypes with desserts from the Muslim world. All with the aim of bringing people together through a love of food. Ali’s often received racial abuse online, which he says is made worse by the political climate and the general conversation about Islam. 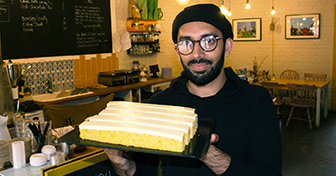 At his dessert pop-up cafe in Hackney he explains how matching western desserts with traditional eastern flavors can educate customers about the Muslim contribution to the food we eat today, and set a different tone when it comes to the bigger debates. Ali also shares his personal reflections of Ramadan, and the spiritual significance of food in his own faith, especially during the fasting season.